Friday the 16th June 2006 dawned with the sun shining and the temperature starting at a respectable 15°C, and with it forecast to climb into the upper 20’s. What a brilliant start for the 158 mile ride to this years National Rally at the Winnington Park Rugby Club, Northwich, Cheshire. I confirmed with John Kennedy what time he was planning to leave, and agreed to meet up with him at our usual meeting point of the BP fuel station on the A419 at between 09:30–09:45, and so it was that with the old Jawa motorcycle loaded up with all my camping equipment I set off for the meeting point. I arrived before John and parked up, but in no time at all he rolled up with his Jawa - Velorex 700 sidecar outfit loaded to the gunnels with equipment. John was certainly not travelling light, and as I was to see later he believes in camping in real style. As we were in no hurry John lead us on a route, which cut out all motorway use, so first it was up to Gloucester, then on the A417 to Ledbury and Leominster before joining the A49 up to Ludlow, Church Stretton and Shrewsbury. We stopped for a coffee break at a roadside American Style diner, before continuing our journey up the A48 to Whitchurch before eventually arriving at the A556 turn off to Northwich. We both pulled in for a fuel top up, and I was amazed to find that I only needed 9.6 litres. Not bad for having covered nearly 150 miles. John’s motorbike I believe took about 14 litres, but then he was hauling a heavily laden sidecar, and even with his lower gearing he had kept up a steady 50 – 55 mph. He really does know how to handle a sidecar! Into Northwich and we were soon entering the Rugby Club site to be greeted by a large number of tents already set up. It had taken (with the stop) 4½ hours to cover the journey, which really was quite respectable considering we had not used any motorways. Our arrival was greeted by several old friends who were seated around the control tent; it was then off to the other side of the campsite to erect our tents. With the sun warm and with only the gentlest of breezes the tents were quickly up and with my gear thrown into my tent I looked over at John to see his tent was immaculately tidy with camp bed, neat quilt, chair, neat cooking arrangement and even a coffee percolator!! There he sat with his white shirt, cravat and hat – looking the immaculate gentleman. Pity the same couldn’t be said about me. As the afternoon progressed more and more rally-ests arrived on a variety of Jawa and CZ motorcycles and the camp site gradually was filling up, and it was nice to just walk around chatting and looking at the various bikes. Early evening saw the clubhouse open up for drinks and for meals. Unlike other rugby clubs we’ve been too in the past the catering for this event was hired in from a private company, and I do have to say that the choice of available meals was poor (although what there was, was very tasty) and the prices were in my opinion higher than we would normally have expected. Still that aside, the rugby venue was exceptionally good. The evening saw many in the club house bar (where I did go for a while) while others sat outside around their tents sipping their own supply of beers, ciders and wine in the cooling evening air. I really do like this time as it is a time to catch up with old and new friends a like just what they have been up to during the past winter months. By 23:30 I was so tired that it was then time for me to go off to my warm sleeping bag. Now I don’t usually sleep too well the first night of camping, but I must have been really tired as except for a short break in sleep at about 02:30 I slept right through till after 07:00. Saturday dawned with the sun streaming through the tent and warming it up nicely, it looked like another warm fine day. Scrambling through the pile of items in my tent I managed to find my gas stove and the loaf of bread I had brought with me. It was now that I found out that even though I had a full cylinder of gar for some reason I couldn’t get it to work. Now I know it was old and the top had rust on it, but otherwise it did look OK. However even despite the efforts on Tom Soffe and myself there was no way I could get it to work. Luckily I did have another half filled cylinder, which did work, so I was able to make some toast and a welcome cup of tea. There was an organised run out starting at 11:00 to the Jodrell Bank Radio Telescope and observatory, although I decided to go into Northwich to get another gas cylinder and to then go and see the Anderton Boat Lift on the Trent and Mersey canal. This was the first lift of its type in the world and has been totally restored back to full working order. Being an engineer myself this really was of more interest to myself and I really enjoyed the visit including actually watching it work. Back at the site more had arrived and I believe that in the end the number booked in was about one hundred, and with the run-out riders returning at about 14:30 the site looked really impressive with tents and bikes everywhere. 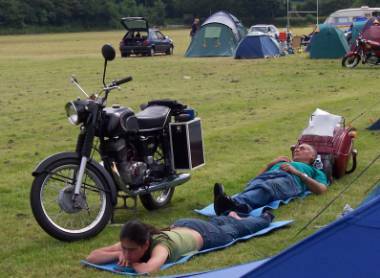 Usually the Saturday afternoon of our rallies sees the customary riding skill events and silly games, although this year due to some Public Liability insurance exclusions we were unable to run them. This really was a great shame as it is usually these events that bring everyone together, and also produce some light-hearted moments. Still hopefully we can reintroduce the events next year. With the afternoon temperature now well into the upper 20’s I just sat in one of John’s chairs (yes he did carry more than one) with a few drinks and just relaxed and watched what was going on in other areas of the site. At teatime John showed his catering prowess by rustling me up a nice meal of eggs, bacon and beans washed down with cups of coffee. 18:30 saw food again being served in the clubhouse, and I believe the prices were now better than the Friday evening (perhaps they had got the message) whilst by 19.30 everyone had retired to the main clubhouse for the prize giving ceremony and for the enormous raffle. In the prize giving John’s combo won an award whilst my old Jawa (due to some vote rigging which would have done credit to the old Soviet politburo) got 3rd place in the ‘Grot Bike’ award. I think it was a wind up from some of my old friends, although as usual Andy Read did win the actual award with his spectacularly grotty Jawa combo. 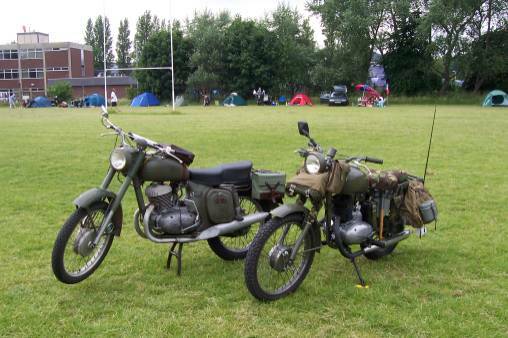 Bob also won the best under 10-year-old bike award with his 26-year-old Jawa – work that one out! In the raffle there were dozens of prizes and some were really good, however despite all this I only won one small item, although Bob did quite well as did a few others. For me the rest of the evening was again spent out in the main campsite, chatting and generally just enjoying the atmosphere and relaxing, and again by 23:30 I was ready for my bed and another good nights sleep. At about 06:15 I woke to the sound of a gas stove burner, and on poking my head out of the tent, John was brewing himself some tea ready for his breakfast. Even at that early hour of the morning it was obvious that a few of the early risers were already packing away their gear, and by 07:30 a number had already left for their ride home. John started to load his combo’, and soon Tom Soffe and his daughter were also packing away. It took me a little longer, but John was on his way by approximately 08:10 with Tom leaving at about 08:45. Tom and Claire had quite a trip back to Newbury as not only were they two up on a CZ 175cc, but they were also towing their PAV 41 trailer, so were not able to maintain a reasonably high speed. I had fully packed away and I too was on my way by 08:50, but unlike John and Tom, I decided to head for the M6 motorway and to get home in the quickest way. 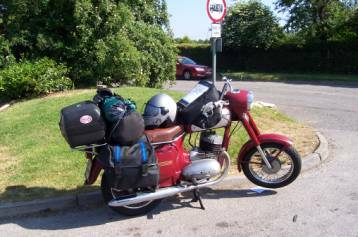 The M6 and subsequent M5 were very busy but the old Jawa was easily able to keep up a cruising speed of 55 to 60mph, and after covering about 100 miles I turned off into one of the M5 Service areas only to find John already there. He had travelled down ‘A’ roads until south of Birmingham where he too had then joined the motorway network. After a short stop we both set off together and I have to say how impressed I was with Johns bike as even though he was fully loaded he was able to maintain a steady 60mph all the way down the motorway, and even on the duel carriage way (A417 & A419) from Gloucester back to Swindon. Tom & Claire - Rallying can be so tiring!!! We said our farewells at Blunsdon, where John headed home to Highworth where I carried on to Swindon where once home I unloaded the bike, put the tent and sleeping bag out in the garden to air, and had a nice cool cider. It was a really enjoyable weekend, and I would like to especially thank Sandy and Mally Morgan for their entire excellent organisation, you both really are stars. To all members who I met and chatted too, it was great seeing you all again, and I hope it won’t be another year before I see you all again. 2007 is the 30th Anniversary of the formation of the Swindon & District Branch, and all being well our Branch hope to host next years rally. More details will come later, but I just hope we can put on an event as good as the one Sandy and Mally had organised. Ian Bridge (Swindon). From Swindon Smoke Signals – with thanks.